Formerly involved with the production desk at Studio Ghibli, Hirokatsu Kihara worked closely with director, Hayao Miyazaki on such hit titles as Laputa: Castle in the Sky, My Neighbor Totoro, and Kiki's Delivery Service. 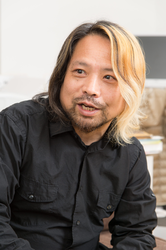 Hirokatsu Kihara is probably best known for his work in the Horror genre. There, he has been a crucial contributor working on such titles as: Tales of Terror: Haunted Apartment and Tales of Terror from Tokyo and All Over Japan which are known in Japan as Shin Mimibukuro. In addition, he has written the books: Tsukumo Kwaidan, Utsushiyo-kaidan, and Kinkiro. Nowadays, he continues to write ghost stories, emcees at monster conventions, and shares his knowledge and experiences at events worldwide.